So I've been sitting on this one for a little while. Mostly because things like having a baby got in the way of me actually writing the review. Pesky labor and delivery . . . pesky recovery and sleep deprivation. But I am gradually coming back to the real world (or at least the virtual literary one) and I wanted to get my review up on release day if at all possible. I can't believe it's been three years since I first discovered this fabulous series. So much has happened in those three years. Kate and Co. have had five seriously awesome adventures and the series has skyrocketed to the top of my favorite urban fantasy series ever. 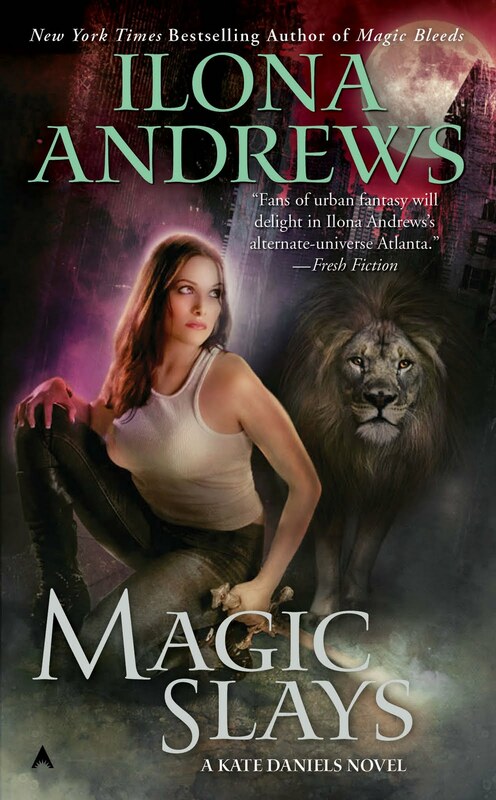 I look forward all year long to the new Kate Daniels book and after the excellence that was the last book, I was positively giddy with delight to receive an ARC of Magic Slays . The fifth book in as solid a series as this one is a delicate matter, I think. You're all in as far as the characters go. Their history is mapped out and complex. At the same time, it can be difficult to take them new places and maintain tension and reader interest without compromising the integrity of the plot and multiple character arcs. I'm happy to say this entry in the series is a worthy one and I didn't look up once after setting my eyes on that first page. A word of warning: This is the fifth book in the series, and there are going to be some inherent spoilers in this review as a matter of course. I do apologize, but it's basically unavoidable at this point. Go grab yourself a copy of Magic Bites and discover the crunchy Kate goodness for yourself! Kate's all set up at Cutting Edge Investigations. She's got an office building, courtesy of the Pack. She's got her trusty attack poodle Grendel at her side. But the population of Atlanta hasn't exactly been knocking down her door lately in need of investigating. Doesn't help that she's an ex-member of the Order of the Knights of Merciful Aid. Doesn't help that her mate just happens to be the Beast Lord himself. What does help is her friend and fellow ex-Knight Andrea is back in town and looking for something to shoot. Fortunately, the newly minted partners don't have to wait long for a target. Paying work arrives literally on their doorstep in the form of an escaped vampire. Ghastek, Kate's contact and sometime nemesis with the People, enlists Kate's help in rooting out the cause behind the rogue vamp. But before she can get too far on that case, Kate receives a visit from one of the elite Red Guard, a force she reckoned with once before in the course of her role in the Midnight Games. Desperate to locate a kidnapped charge, the Guard offer a sweaty wad of cash in exchange for Kate's services tracking down the missing scientist and the even more mysterious contraption he was working on. Hoping to establish her business and herself independent of the Pack and her high-ranking role in it, Kate takes on both cases and, in true Kate fashion, cuts a swath through magic-torched Atlanta in her quest to solve them. "This is the hand I slapped Aunt B with." "Maybe you should have it gold plated." "Here, you can touch it, since you're my best friend." "Yes I can. Listen, this is me telling you what you will not do." I raised the cookbook and tapped him on the nose. Bad cat. Hehe. I could listen to them spar all day long. The relationship between Kate and Curran grows in this book, and interestingly, it's mostly through the conversations they have. Both of their first instincts is to settle arguments with a nice fight until, bruised and bloody, one or the other is forced to call Uncle. But somehow they manage to actually talk here. I love it when they do that. I love the sure sense I get when reading these books that the authors know exactly where it's going. Amid each individual mystery and/or crisis, we never lose sight of the overarching issue, of the inevitable showdown Kate's been preparing for her entire life. This is especially evident in the heart-palpating conclusion. I didn't see it coming. And it has me thirsting for more. Magic Slays is a rocking good time. Crunchy Kate goodness at its best. Magic Slays is due out today! "Pesky", eh? You make me laugh. And yes, MAGIC SLAYS.. I would very much like it to arrive in my mailbox sometime soon. Yay, so glad to know that you loved this one! Makes me more excited to read it. 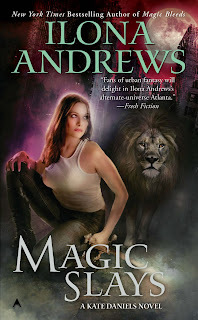 Again, thanks for introducing me to what has become my favorite urban fantasy series. :) Looks like this installment is just as good as the others. Happy book birthday to Magic Slays! Pesky labor and delivery will get you every time. Congratulations!! Hehe. I love this review! I need some crunchy Kate goodness. Must run out to Borders quick. Oh man. I have been stalking my mailbox the last couple of days waiting for this book to arrive. So happy to hear Kate and Co are back to their old tricks. Le Sigh..loved this book so hard. Kate Daniels is just an amazing heroine. The Andrews can sure tell a story! Bought this one yesterday. I can't wait to read it. I finished this one today, it was fantastic! Allison, what did you think of it? Fiction Vixen, oh, man. I am seriously crossing my fingers Andrea and Raphael get back together. It makes me so anxious when they're at odds with each other. Michelle, have you finished it yet? Mandi, can't they though? *sigh* I love Kate & Curran so very much. Karen, did you finish it yet? Tiah, it really was. I've been rereading my favorite scenes. Love them.